I cannot believe that it is already May...and that I'm done with my sophomore year of college!!! I wrapped up exams right at the end of April and came back to Texas . Let me just say, it is nice to be home after four months away. I didn't get very much time at home over winter break, so it will be really nice to spend the next few months at home, working and spending time with my family. 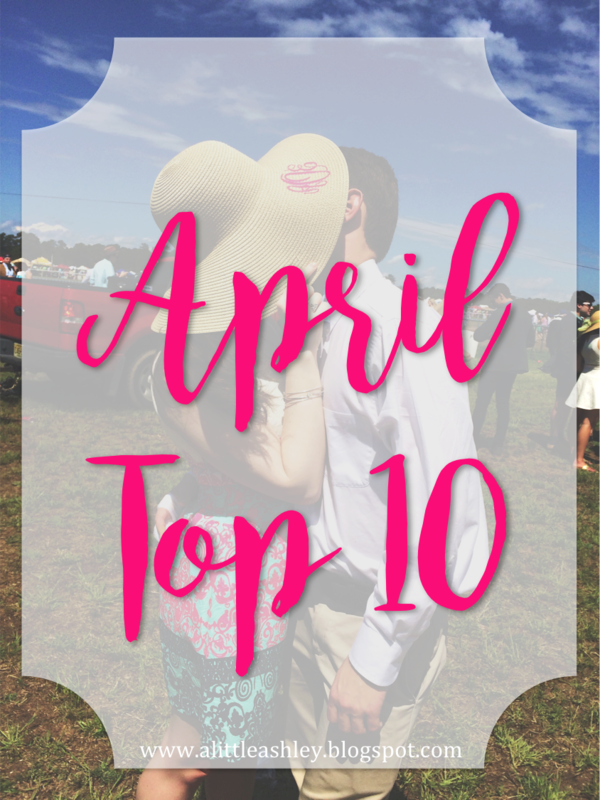 April was an insanely busy month, and here are a few of my favorite things from the past few weeks! experience // April involved quite a few fun weekends away from school. My first favorite event happened the first weekend of April, Carolina Cup. For anyone not from around South Carolina, Carolina Cup is a horserace in Camden, South Carolina that takes place every year. There are lots of bright colored preppy clothes, big hats, and tailgating. There's even a college park area, where fraternities from colleges from all over the state can rent tents and set up tailgates. I went with Clemson Delta Chi, my boyfriend's fraternity, and we had a blast! The next best weekend was a few weeks later when we went to visit my boyfriend's sister and her family. They live a few hours away and we got to spend the weekend hanging out and playing with Mike's nephew. As much as I love Clemson, I really needed a weekend completely away, and this one was perfect. beauty // I have used the same foundation since high school, but this month I found a new option I like just as much (if not more)! I had heard about the Rimmel Lasting Finish 25hr Foundation from YouTube channels I follow, but I never had a need to try it until my favorite Covergirl foundation was out in my shade. I got the Lasting Finish in the shade 091 light ivory (the lightest shade) and it is the best color match for my pale skin I have ever found. It has a bit of scent to it, which made me a little nervous, but it goes away when you blend it out. It is full coverage but feels super light because it has a serum in it. It's also SPF 20! I highly recommend!!! clothing // Over spring break I jumped on the kimono trend, and let me just say, I'm obsessed! I've been a fan of the kimono look for a while, but since it's so trendy (and I'm typically more preppy and traditional) I was hesitant. I also had a hard time finding one I liked, until I found the adorable Barefoot Boutique at the Ventura Harbor Village when I was in California. I couldn't find the exact one I have online, but I love this blue one from H&M and this adorable lacy one from Forever 21.
song // I wouldn't say I had a favorite song for April, but there is one that I heard a ton and really like: "Record Year" by Eric Church. It is not the happiest of songs, but the lyrics are a clever play on words and I just love Eric Church's voice. tv show // I have been working my way through Parenthood on Netflix since Christmas break and I just finished it. Oh my goodness it is so good! I love shows that are on the more realistic side, and this one definitely shows the very real, complicated nature of families. It is sweet and funny and just overall really well done. I might have cried a lot little during the finale. Check it out if you're looking for something new to watch. youtube // Again I don't have one particular YouTube channel that I've been loving, but I have been using YouTube in a different capacity lately. Of course tons of YouTubers review all sorts of different products, but I had never actively searched out this type of video, until lately. Trust me when I say there is a YouTube review of everything. The past few weeks I have been debating what planner to get for junior (!!!) year, I don't want to invest in a certain one and end up not liking it so I have been watching tons of reviews of planners I'm interested in. This probably seems super weird, but I heavily rely on my planner and am very particular about them so I want to make sure I get one I will love. Again, there are videos on anything you could possibly imagine so I highly suggest looking into some reviews before buying new items. blog // My favorite blog (and Instagram feed) lately belongs to Hailey from Hailey Daily. This girl's style is flawless to say the least! I don't think I have seen an outfit post from her that I didn't immediately want. Her style is very girly, sometimes more preppy and others pretty trendy, but always adorable. I always check the like to know it notifications from her posts to see where she finds all her cute clothes. movie // I don't have a favorite movie I've seen this month. With the end of school, I didn't have much time to see any movies. However, Netflix just added a bunch of new stuff so I'm looking forward to using some of my newfound free time to watch a few movies and maybe start a new series. random // PLANNERS! I know I used this as my favorite last month too but I am obsessed. A lot of the popular brands like Simplified Planner and Day Designer are releasing their new lines and they are all adorable. I love a good planner because it helps me pretend that I've got it all figured out and that everything is going to go exactly as planned (ha!). Coming off the craziest semester of college I've had so far and heading straight for an insane fall, I know I need something that will really help me keep my sanity. Like I said earlier, I've been looking at all sorts of reviews for different planners so I can figure out which one to get for next year. I love to see how other people use their planners and plan their days. If you want to be occupied for hours, looks up decorated Erin Condren planners. It's amazing. looking forward to // Spending the summer at home! I love going to school at Clemson, but it is so nice to be home for the summer. I hardly get to see my family and hometown friends when I'm at school so I'm excited to have the whole summer to hang out with my mom, dad and younger brother. My best friend and I are already planning some day trips on the weekends to the beach and Magnolia Market, Fixer Upper stars Chip and Joanna Gaines market, in Waco. It's going to be a nice relaxing break. I am hoping to get back into blogging now that I am home for the summer!